Google just launched the latest version of Google Earth for iOS. 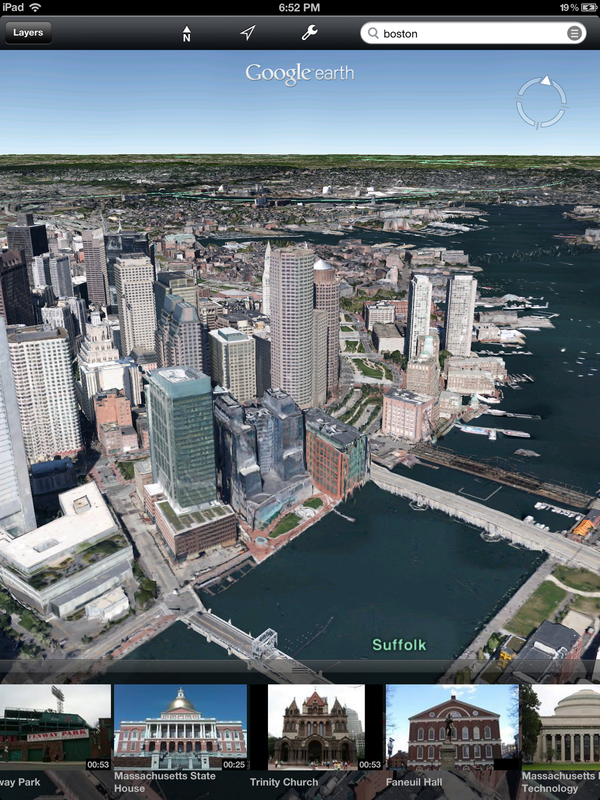 This update brings Google’s new highly detailed 3D imagery of a select number of cities to the iPhone and iPad. Google first announced these new features in a hastily arranged press conference in early June to scoop Apple’s own 3D maps announcement a few days later. The company first launched this feature on Android phones and tablets in late June. This new version of Google Earth for iOS also features Google Earth’s new tour guide feature. As it takes a good amount of processing power to produce these 3D images on the fly, Google will only show the new 3D imagery on the latest version of the iPad, the iPad 2 and the iPhone 4S. Users need to be on iOS 4.2 or newer. Every other iOS device will also get today’s update, but the new feature won’t be available on older phones and tablets. For the time being, Google has only made these new 3D maps available for Rome and about a dozen cities in the U.S., including most of the San Francisco Bay Area, Tampa, L.A., Boston and Portland. Unlike the Google Earth Android app, the new iOS app won’t show Google’s old hand-made 3D models in cities that don’t feature the new imagery yet. Oddly enough, Google has completely focused on making its 3D imagery available on mobile but hasn’t made it available on the desktop yet. As Google Maps product manager Peter Birch told me yesterday, though, the company plans to bring the new maps to the desktop before the end of the year. He also reiterated that Google remains committed to expands its 3D maps to cover a large number of additional metropolitan areas around the world (covering about 300 million people) before the end of the year, too. Given that Apple is switching away from Google Maps with the upcoming release of iOS 6, I couldn’t help but also ask Birch about the company’s plans for a regular mapping app for iOS. He wasn’t quite ready to announce anything yet, though, and just stressed that his group is “passionate about maps” and wants to bring its product to “users everywhere.” I would be very surprised, however, if we didn’t see a Google Maps app – maybe even with integrated turn-by-turn navigation – arrive on iOS before the end of the year.